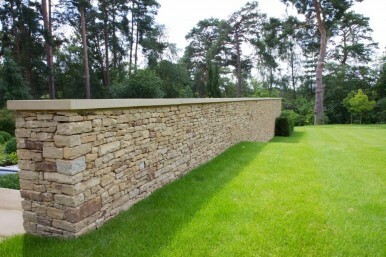 PC Landscapes created the stone walls for this beautiful garden in Farnham, Surrey. The garden was designed by garden designer Andy Sturgeon. PC Landscapes won the tender to build the entire design which included complete re-grading of the ground, demolition of existing structures, new walls, integrated lighting, rainwater harvesting, irrigation. It also required construction of a large water feature and a swimming pool with associated filtration systems. Built by hand with natural stone, this wall will only look better with age. Allowing nature to take its course – algae and moss growing will only make it more attractive. Alternatively if you prefer the clean new look, It can be easily cleaned with a pressure hose.